No prizes for guessing where my first stop was on a recent restaurant pilgrimage to the Bay Area. 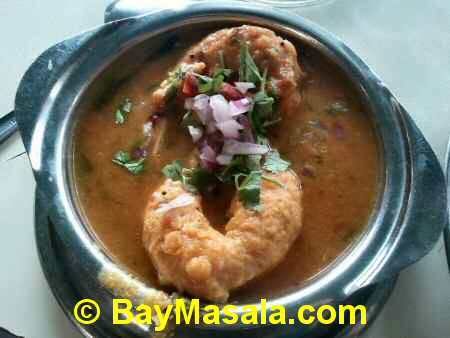 Golden Gate Bridge can wait and Sausalito can go to hell but Saravanaa Bhavan, here I come! For all those schmucks out there who don't know what I am talking about, Saravanaa Bhavan is a popular South Indian Vegetarian restaurant chain from Chennai. NRI's hailing from the South Indian state of Tamil Nadu are known to bestow more affection to Saravanaa Bhavan than on their spouses. Back home in India, our NRI Tamils probably treated the restaurant as an extension of their kitchen. If you don't believe me then just mention the name to the next Tamil person and rest assured you will see a huge grin and the drooling tongue making an appearance. Over the years, the popularity of Saravanaa Bhavan has caught on with non-Tamils too. With eager anticipation and unabated hunger. 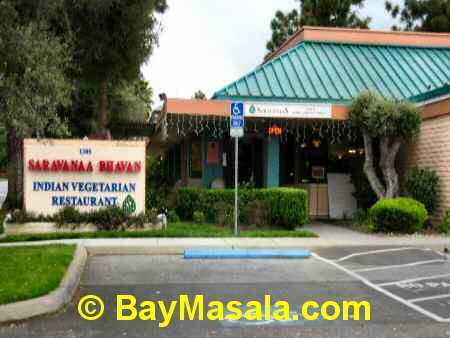 I ventured into Bay Area's Saravanaa Bhavan hoping for a fulfilling culinary experience. Thankfully, Saravanaa did not cut corners with the location and provided a sizeable parking lot for patrons. 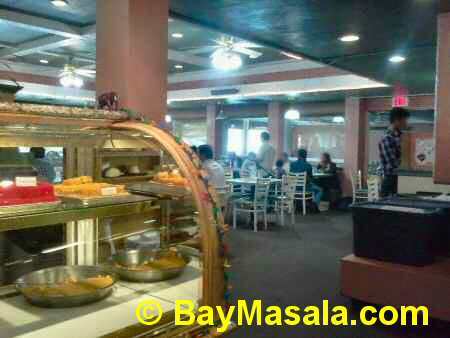 It was Tuesday afternoon and the place was buzzing with desis but there were enough tables available. Naturally it was a bit cramped because the owners want to squeeze in as many people as possible and the patrons probably get a feel of being in Chennai. Hey! It is Saravanaa Bhavan, not your fancy American restaurant. The facilities were basic and adequate - plastic glasses for water, clean cutlery that seemed severely used and one paper towel. Knowing that Indian food is primarily finger food and they don't serve finger bowl in the US, they could have at least kept more paper towels on the table?? A minor grouse. Considering that Chicago does not have a Saravanaa Bhavan, we wanted to pretty much order everything on the menu but blood pressure, cholesterol, and fear of weight gain controlled our appetite. 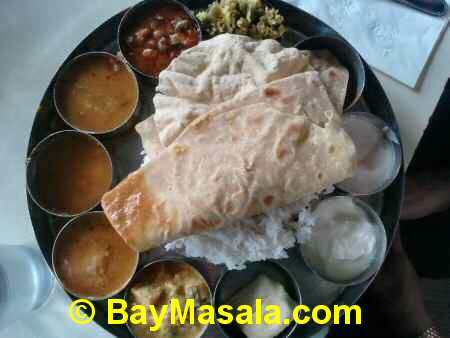 Here is what we devoured in the 45 minutes we dined at Saravanaa. 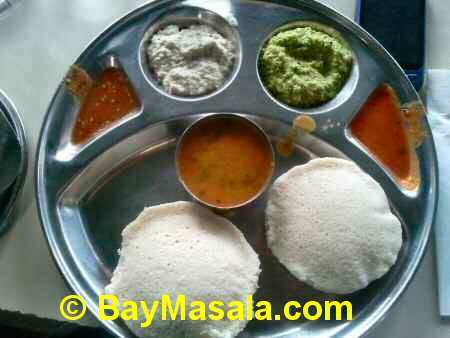 Saravana passed the basic litmus test of serving good Idly. 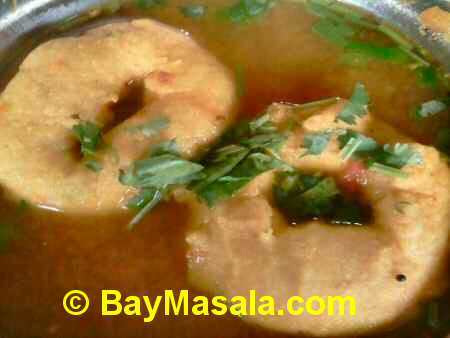 After all what is more fundamental than Idly Sambar in a South Indian Restaurant? The Idlies were warm and spongy but maybe a bit undercooked on one side as it was sticking to the plate. Nonetheless, the taste was authentic and refreshing! Both Vada items were quite satisfying especially because of the Sambar, which instantly took us to Chennai, and the Rasam, a heavenly delight. Even if they had put Rasmalai instead of Vada in it we would have happily gobbled it. Although we were licking our lips, the not so fresh feel of the Vada in Sambar Vada didn't escape our seasoned taste buds. Were they dumping the previous day's leftovers into the Sambar and making a quick buck?? Alas! The Rava Kichidi was anything but satisfying. Lacking in warmth and its trademark aroma, we had to thank our stars for the delectable Sambar and delicious Chutney that helped us finish off this disappointment. The aromatic Ghee Pongal was expectedly pasty and tasty. It was warm but we would have loved it steaming hot. The Chapati is the only item that comes close to anything North Indian cuisine but this is also a practical joke played by Tamils on Northies because this looks and tastes nothing like the Chapathi of the North. 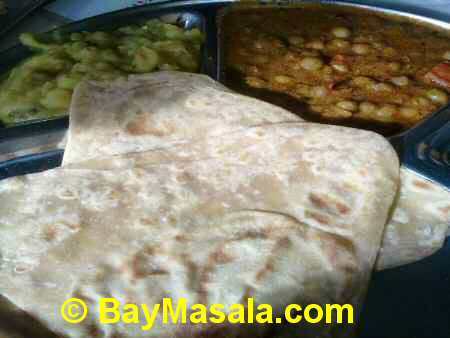 The warm Chapathis were served with the aromatic, warm and well-cooked Potato Masala. The other side dish that came along with Chapathi was a southern style Mutter subji with grounded onions and green chillis, which give a smooth feel and juicy onion taste that is unmatched. 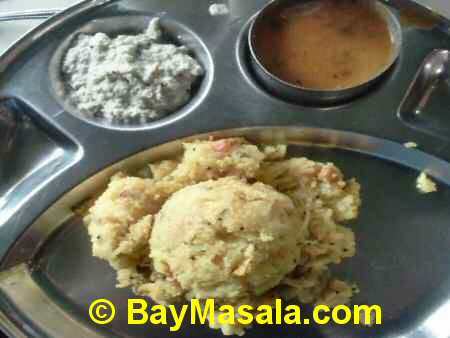 Unless you are looking for Mysore in the Bonda and Masala Dosa you should be thrilled with them. 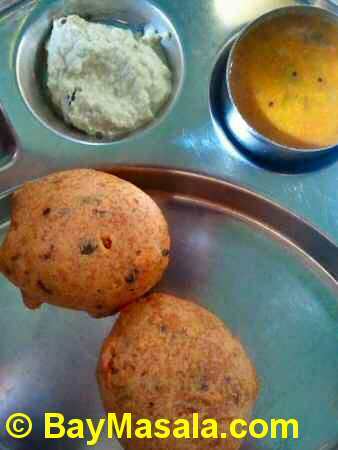 I had Mysore Bonda after many years and I could not have picked a better place. The Bonda was big, warm, non-oily and generously sprinkled with coconut slices. Each bite took me a step closer to moving to the Bay Area for good. 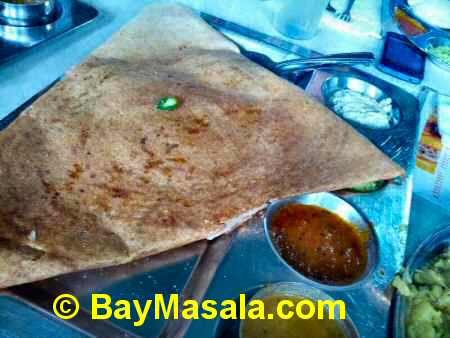 Mysore Masala Dosa was perfect with evenly spread spice chutney on the inside. After trying the run of the mill items, we shifted attention to Saravana specials. 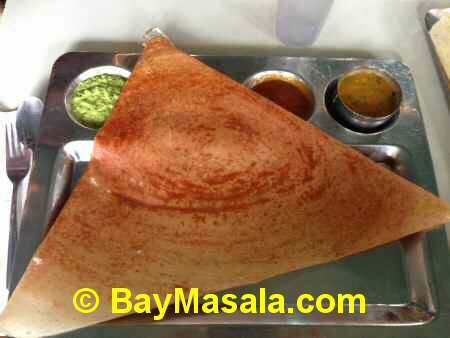 Saravana Special Dosa turned out to be a minor variant of the Mysore Masala Dosa with "Milagai Podi" on the inside instead of the spicy chutney. Potato masala was served on the side along with the usual dippings. The Dosa was very nice but it was still a minor disappointment because the "Special" Dosa was simply not "Special" enough. The next item on our "Specials" was the Meals. Thankfully this turned out to be a much better option as the meals was rich in terms of variety as well as quantity. The Saravana Special Meals had White Rice, Sambar, Rasam, Kaara Kuzhambu, Kootu, Daal, Beans Poriyal, Curd, Carrot Raita, Appalam, Sweet and Pickles. Between a choice of Poori or Chapathi, we picked the latter and a bad choice on hindsight. The plate was warm and tempting with adequate portions. The exception was the Chapathi, which was a bit thick. It was the same type of Chapathi we had as a separate item but this one was allowed to cool down which made it thick and less enticing. The Sambar and Rasam were consistently great but my picks on this plate were the yummy Kootu and Spicy-Tangy Kaara Kuzhambu. The yummy Butter milk was a fine thing to have on the side. 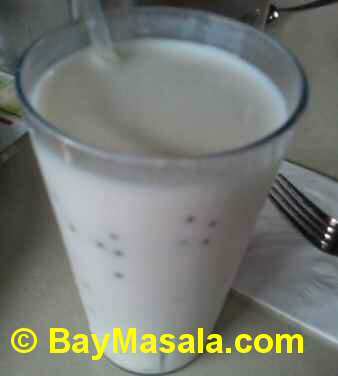 Mango Lassi was ok - usual stuff. The unsung heros of our Saravana Bhavan experience were the warm, fragrant, tangy and enchanting Sambar and Rasam. Along with the luscious chutneys, the Sambar and Rasam alone are good reasons to visit Saravanaa. Kudos to the speed with which our order was served. Literally in minutes. Middle Finger to all other aspects of Saravana's service. Besides the speed, everything else was a struggle, including getting water refills or getting the waiter's attention for a follow up order. The waiters seem to be in a state of constant rush even when the place is half-empty. They completely missed our Kheema Idly and walked away before we could order dessert. Bring out the Indian in you and ignore their indifferent service, which is reminiscent of how it is in India. 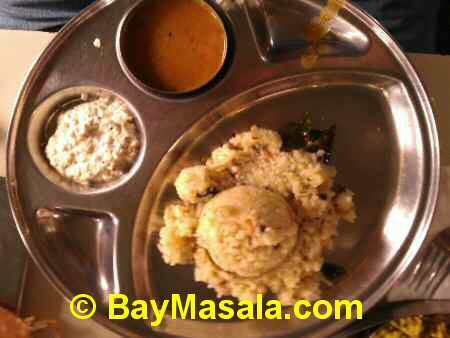 Saravanaa Bhavan is for South Indian Tiffin in the same way as Ghirardelli's is for Ice Creams and Sundaes.